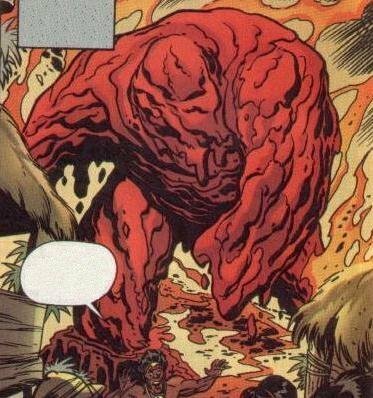 Powers/Abilities: The Molten Man-Thing's body is comprised of a lava-like substance, with which it can burn through almost any obstacle. It appears to have had little control over its abilities, and spread its lava and fire wherever it strode. Its fiery nature made it invulnerable to most physical attacks, but extremely susceptible to cold-based assaults. History: (Tales of Suspense I#7/Marvel Universe#4 (fb))- The Molten Man-Thing was first observed as it arose from a volano at Napuka. It set forth to destroy the villages there, but was opposed by Makkari, in the identity of vacationing pilot Frank Harper. Unable to wound it with spears, Makkari had the monster follow him into a wind tunnel, then activated it. The intense cold of the winds weakened the creature until it finally retreated, returning to the volcano it came from, apparently to die. (Fantastic Four Unlimited#7)- Many years later, artist Frank Johnson re-created the Molten Man-Thing using the enchanted paints he had obtained from Yucoya-Tzin. Believing the creature to be a threat to the city, the Fantastic Four attacked it, and nearly had it beaten, when it disappeared, its few minutes of life having evaporated. Comments: Created by Stan Lee, Jack Kirby, and Steve Ditko. Marvel Monsters: From the Files of Ulysses Bloodstone and the Monster Hunters#1 contains a theory that the Molten Man-Thing is actually one of the Lava Men. Makkari was not revealed to have been Frank Harper until the retelling in Marvel Universe#4. Thanks to MD Carter for allowing me to borrow these images from his website, The Monsters of Jack Kirby.